I am feeling the post holiday malaise. There are so many things to do that I don’t know where to start. Also not one is craft related. I didn’t even know what to blog about. I went though my swatch collection and didn’t like anything, then through books, etc. As I walked past this lamp I thought why not. I made this lampshade in 1994, 15 years ago. The lamp originally had a pretty beige Tiffany style shade on it which I loved. A glass shade on a floor lamp doesn’t do well during an earthquake. First I found the frame, then found the dark green lace (which was way too expensive for a lampshade) and matching chiffon. Then I bought really long rayon fringe and dyed it two tone to match. The braid outlining the frame looks dark in the photo but is actually gold like the lining. I remember I stretched the fringe across the whole apartment to dry it. We had to duck to go from living room to kitchen. Obviously the apartment was small. I didn’t really know what to put in the diamonds so I just hand sewed beads in a stipple pattern. The first diamond has lots of curves in the pattern, the last has a lot less. I got tired of sewing beads. The part I like best is working on the chiffon rosettes. They are done by hand stitching a big circle and drawing it up tight. Then the puff of fabric is draped and tucked, pulling the stitches back through the center forming petals until it looks like a rose. Finally the gathers are adjusted around the shape that is being filled in, pinning in place until ready to secure by stitching. I wish I knew something else on which to use the technique. 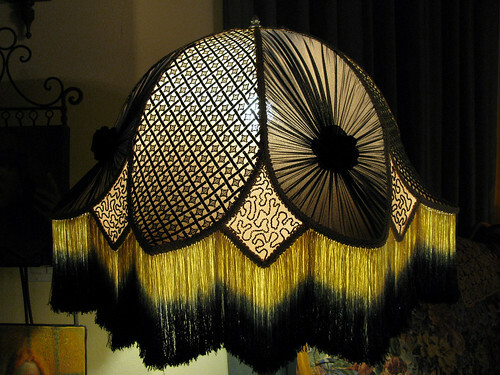 Originally I wanted to make beaded tassels to go at the points, but enough is enough, especially for a lampshade. This entry was posted on Tuesday, January 6th, 2009 at 3:00 am and is filed under Craft, Lace and Sewing. Tagged: Beading, Craft, Lace, Sewing. You can feed this entry. You can leave a response, or trackback from your own site. Sometimes hte hardest part is just getting started on all that stuff you really don’t want to do. I find that a list helps and I put the simplest things down so I have lots of little things to cross off. Makes me feel productive even when I’m really not that much!